The Daikin Altherma product range, available from Vent Axia, features a selection of air source heat pumps including single and three-phase split systems from 6-16kW. All split systems comprise separate indoor and outdoor units, with the indoor units available as either heating only or heating and cooling options. 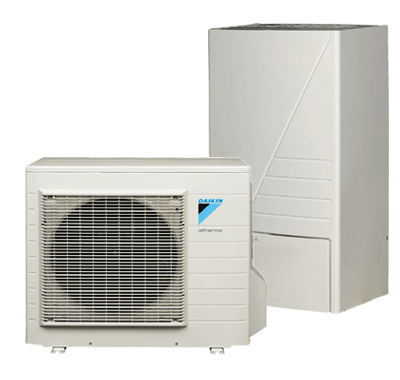 Vent-Axia also offers the Daikin Altherma monobloc system, in which all the hydraulic parts are located within the outdoor unit of the air source heat pump. In this system the water pipes - rather than refrigerant lines - run indoors from the outdoor unit, making installation much quicker and easier for the domestic installer. The monobloc unit is available in both single and three-phase from 11-16kW. A high temperature air source heat pump completes the range available from Vent-Axia. Available in single and three-phase from 11-16kW, the unit features unique cascade technology that can heat water temperature up to 80°C without needing an electric heater to boost the temperature. The high temperature system is capable of delivering heating and hot water, as a direct replacement for a traditional boiler, without the expense of changing the existing radiators.